The parade of ranked teams for UMD to play continues. All opponents the Bulldogs have faced this season were ranked in the top twenty. So what are rankings worth? It is a decent indicator, but this guy relies more on the PWR after Jan. 1 than voters... ever. That said, SCSU is ranked, but still an unknown. Being swept by Minnesota State Mankato, sweeping UMTC and Alabama Huntsville. Lots of questions with maybe some answers this weekend. Picks by @afiskness. Now we have moved to November and the college hockey season really starts to heat up with league play. Although, for UMD you could say that happened last weekend by sweeping the North Dakota Fighting Hawks at AMSOIL Arena in their first NCHC games of the season. 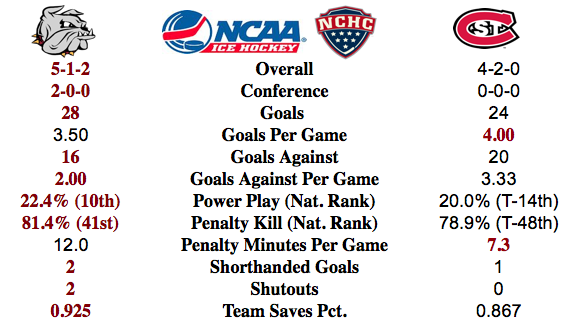 Strong goal tending and special teams has put the Bulldogs tied at the top of the NCHC after one week of play. Minnesota Duluth @ St. Cloud State: The Herb Brooks National Hockey Center in St. Cloud is always a tough place for visiting teams to win at and this is the first games this year for the Bulldogs on the larger sheet of ice. I am going to go with a split. 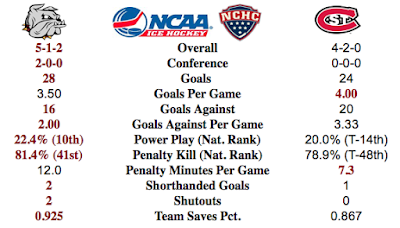 Colorado College @ Nebraska Omaha: Until the Tigers show me that they can win on the road in conference games I am not going to pick them to win. Mavericks sweep. Miami @ Western Michigan: The Broncos played well against the non-conference WCHA foes the first couple weeks of the season but had a tough time of Denver last weekend. Miami looks like they could be a strong team again this year. I am going to go with a split since the games are at the Harry W. Lawson Ice Arena in Kalamazoo. North Dakota @ Minnesota Twin Cities: After being swept in Duluth last weekend, the games may not get much easier for the Fighting Hawks who go to Mariucci Arena to play the Gophers. This is the first game between the two teams since the Gophers beat North Dakota 2-1 on April 10, 2014 to advance to the NCAA championship games against Union and the last time the Gophers hosted North Dakota was January 19, 2013, a weekend that ended in a win and a tie for the Gophers. The past is the past. There will be a lot of emotion from players and fans for these two games, I will pick a split.